Campsite le Petit Mousse is a fantastic 3 star family friendly campsite not only occupying a fantastic position in the South of France but also offering lots to do both nearby and also on site. The campsite is extremely well looked after and beautifully landscaped with tropical styled trees and plants in abundance providing a degree of opulence and that makes you feel like you’re in paradise. Located in an extremely popular area, the campsite offers visitors a whole wealth of places to visit. Many of the local towns including Vias, Beziers, Agde, Serignan and Valras-Plage offer a great deal of activities and attractions which are suitable for all ages and budgets, ensuring that you have a truly memorable holiday. One of the great things about Campsite le Petit Mousse is its close proximity to the wonderful Mediterranean sea and the beaches the line its shores. The campsite has direct access to a lovely little beach where you can relax on the soft golden sand. Within walking distance of the campsite are a number of other, larger beaches which literally stretch out for miles and miles. 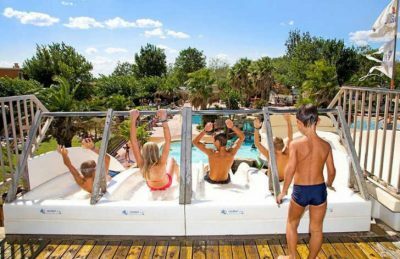 Whether you like a swimming pool complex for its sunbathing, swimming or fun factor you won’t be disappointed by the pool complex at Campsite le Petit Mousse. The amazing large aquatic area has a Californian styled pool with plunge pool, children’s pool, rocky areas, bridges, tunnels, islands, sunbathing areas with shades and several fantastic water slides. Campsite le Petit Mousse benefits from a brilliant location and fantastic pool complex but it also offers a comprehensive range of activities and facilities on site. On site activities at Campsite le Petit Mousse include a multi sports area, table tennis, football, volleyball, basketball, cycle hire and a playground. Facilities available at Campsite le Petit Mousse include WIFI, restaurant, snack bar, takeaway, bar, groceries, animation team, games room, tv room, washers and dryers. Accommodation at Campsite le Petit Mousse includes a range of 2 and 3 bedroom mobile homes that are available from Suncamp.